El Paso Corp. (EP) intends to separate its pipeline and midstream operations from its exploration and production groups as it plans to split into two publicly traded businesses by the end of the year. The move follows in the footsteps of several other large U.S. companies that have determined in recent months that the sum of their parts is worth more than the whole. Hedge fund JANA Partners LLC boosted its stake in El Paso earlier this month to just over 4%, a move that was widely viewed as an effort to help force the natural-gas provider to break up. Shares of El Paso recently were trading up 7.7% at $20.45 premarket. The stock has risen 79% over the past 12 months as of Monday's close. "With the completion of what was an $8 billion pipeline backlog, the elevation of our E&P business to one of the top independent producers, outstanding leadership and employees in each of our businesses, and the accelerated improvement of our balance sheet, we are ready to take this important step," said Chairman and Chief Executive Doug Foshee. El Paso said its pipeline company, with a planned 2012 annual dividend of 60 cents a share and a targeted low double-digit dividend growth rate, will be an attractive corporate yield investment. The company's exploration and production business has more than 10 years of low-risk, repeatable drilling inventory to fuel its future growth, making it well-positioned to compete with other independent producers. 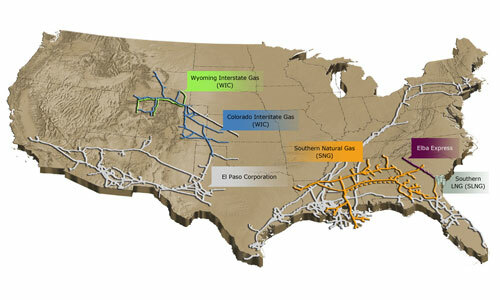 El Paso, which owns the largest network of interstate natural-gas pipelines in North America, has been focused on completing an expansion that includes five major pipeline and liquid-natural gas projects. Earlier Tuesday, the company said it increased its budget for exploration and production programs by $300 million to $1.6 billion. Following the proposed spinoff, El Paso wil be composed of its pipeline group, midstream group and its general and limited partner interests in El Paso Pipeline Partners LP (EPB). The move to split the company follows similar recent plans disclosed by Williams Cos. (WMB), Marathon Oil Corp. (MRO), Sara Lee Corp. (SLE) and ITT Corp. (ITT), among others. El Paso reported earlier this month its first-quarter profit dropped 84%, as the company's pipeline group saw pretax earnings rise 10% and the exploration and production unit swung to a loss.